I hope your week is off to a good start. My Monday was not a good one at work - way too much bending and lifting - I'm getting too old for this! I was so happy to get home, relax and watch some of my favorite designers' videos! I know you all watch Jennifer McGuire's and Julie Ebersole's videos. They both had really inspiring ones today! You can watch them here and here. Another favorite card designer of mine is Darlene DeVries. She is so easy to watch (I love her voice) and she makes fabulous cards! So, after watching her video today, I just had to CASE her card. The panel was first covered with Gesso, then I used three different metallic Gelatos to add color. When I was happy with it, I took a new Memory Box Stencil called, Rings and Puddles and placed it over the panel, then wiped with a baby wipe to remove some of the color. Love that technique! The bottom of the card was created using the Falling Hearts Stencil from SSS, some embossing paste and a bit of sparkle embossing powder. I did not add Gesso to the hearts like I did to the panel. You can see the different effects you get with and without Gesso. I want to thank Darlene for the wonderful inspiration! It felt so good to get my fingers messy today! I thought I might as well add this to the Simon Says Stamp Wednesday Challenge: Have a Heart. I have Tuesday off from work and I'm planning on relaxing A LOT! Then I'm back at it Wed. Thurs. and Fri. Wish me luck - it's gonna be crazy! Beautiful card!!! Love how you used your Gelatos. Wishing you luck! I LOVE your card Barb and I just had to watch Darlene's video. You did an awesome take on the card. Hey there Barb...I hope today is a super relaxing day. Love the gorgeous combination of colors and the touch of texture is fabulous. Very nicely done, Barb! I love this card. The gelatos are so pretty. WOW, this is simply FABULOUS, Barb! Your beautiful creation & your detailed description of the process makes me want to go play with gesso. Thanks! Now, I'll have to watch Darlene's video. Hope you have a relaxing day today. This is gorgeous! Love the shimmer! Have to try the stencil/baby wipe technique! Great effect! Rest up for all those Valentine customers! wonderful card, Barb - and thanks for pointing me to Darlene's videos - added her to my Bloglovin' list - have a restful day before the onslaught of valentine customers. Barb, it looks beautiful! I love those metallic gelatos. Enjoy your day off today! Fabulous background Barb and I love the soft shimmer on the hearts. Stunning card Barb, your background is amazing! What a beautiful take on Darlene's card! I love how your background turned out with all those pretty colors and the shimmer on the falling hearts is amazing! 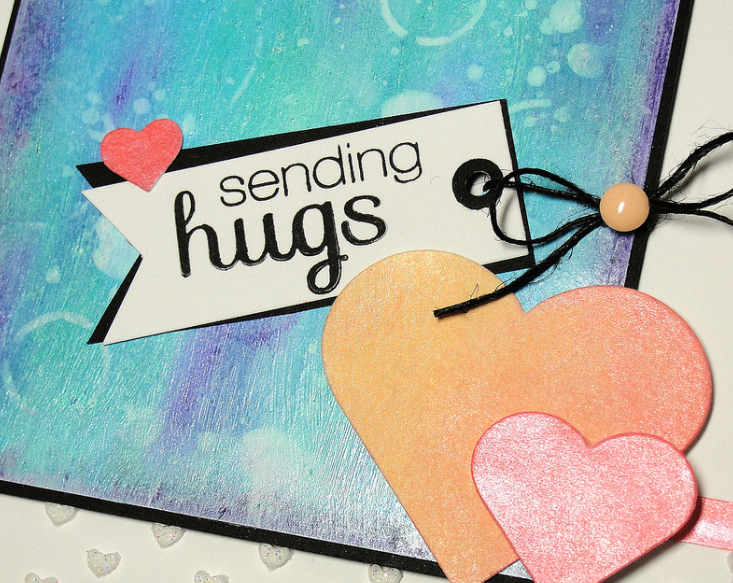 I also love how you framed your panel and sentiment tag in black, Barb...it really makes everything pop! Gorgeous card, my friend!!! I sure hope you get lots of rest today, and that the next few days fly by quickly for you! I think we all need to appreciate people like you, who are 'behind the scenes' on Valentine's Day...you certainly make this holiday really special for the rest of us! Gorgeous card Barb! I love the shimmer effect. Hope you have a restful, sweet and Happy Valentine's Day! 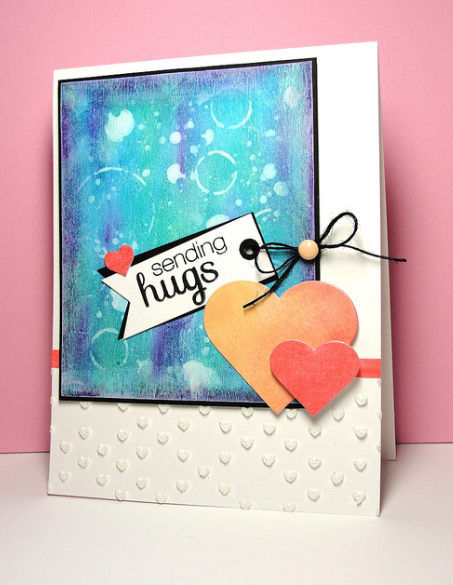 Love how you showed the difference between the gesso and the "naked" with the gelators. Really pretty effects Barb. Hope you get some rest and relaxation in before the rest of the VDay madness. Gorgeous card Barb, I love everything. Love how Darlene's video inspired you, Barb! I love that you always try new things and are so willing to share with us! The textures and shine on this card are so neat! Love the gorgeous colors that you chose! SUPERB! And oh..I hope Valentine's Day is over soon for you at the shop! It must be crazy busy at the flower shop! Take it easy whenever you can, my friend! Just wait until you're even a few years older, except that I'm partially retired now, so it isn't so bad. I just smiled to myself when I read the names of the gals you referenced. These are 3 of my "favs", and of course I enjoy following you and for sharing your ideas. Get some rest and stay warm. Great take on Darlene's card! Gorgeous card, Barb! I love Darlene's cards too. Beautiful hearts and cute background with the blue. I forgot to say, love your cat Murphy! How cute. Love all the techniques you used in this card Barb!! I just ordered my first Gelatos and I'm off on a snow day and they are scheduled to come today!! I can't wait to try your technique!! Oh how I love this card, Barb! You've inspired me to use my Gelatos & a baby wipe over a stencil--really cool! Relax & prepare for the rush! Gorgeous card my Friend! so much light! Wow, this is a beauty Barb!! Gorgeous! Love all the techniques you used. Hope your work days are getting easier, but I'm guessing you won't get much relief until Valentine's Day is over. Hang in there, my friend. So cool! Love how you did the stenciling at the bottom! Need to try this gesso stuff...looks really cool! How Awesome is this!!! Love this Barb! Gorgeous Gelato effect, love the metallic Gelatos. Hope you had lots of relaxing before the crazy of Valentines day!! So beautifully made Barb, and the colours and shimmer, oh so lovely! I hope that you are resting well this weekend from what must have been a hectic week in your department! Take care sweet friend. Hey Barb - it has been a while since I visited your. Your card is beautiful and I am going to have to check out your inspiration. I have some Gelatos but don't use them like I should. Thanks for the sites!